Send a fresh bouquet of creamy white roses and fragrant oriental lilies mixed with greenery. Simple, classic, elegant. You can`t go wrong with an all white flower bouquet. Perfect on its own, or paired with a beautiful bottle of sparkling wine, Ecoya candle or chocolate available from our small gift add on selection. Order your flowers online, email us directly to sales@flowersforeveryone.com.au or give us a call on 1800 66 66 46. 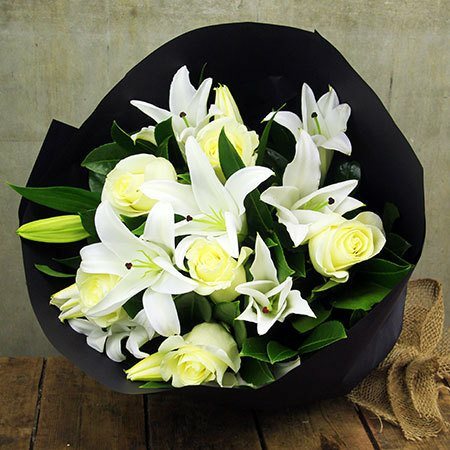 *This specific lily and rose bouquet and price is available for delivery within Brisbane and major Australian cities. If you would like to send a similar style flower bouquet elsewhere in Australia, please give us a call on 1800 66 66 46 or email us directlly at sales@flowersforeveryone.com.au. Our florist team will provide a quote based on your delivery location and place an order on your behalf.